HIGH QUALITY - Durable Nylon Fabric, provides the function of water resistance, keep inside dry to protect books, electronics or clothes. 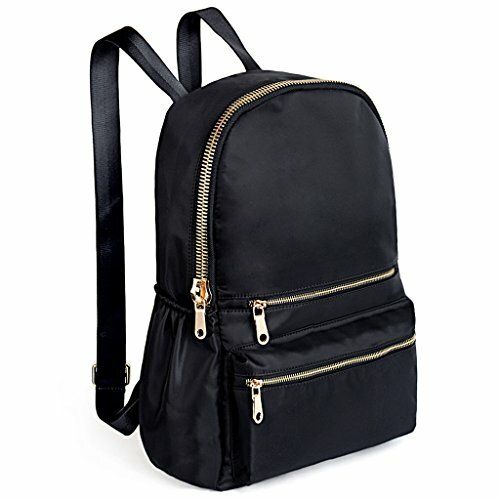 WELL DESIGN - **High quality smooth Gold color zipper hardware. **Full-lined cappuccino polyester lining. **Built-in SHOCK PROOF foam padding on the back protects electronics. **2 adjustable nylon back straps prevents sliding off your shoulder. LARGE CAPACITY - Roomy space with 1 large zipper section, 2 front zipper pockets, 2 open side pockets and 1 back zipper pocket. Main zipper section contains 13.3" Macbook compartment and 1 inner zipper pocket. Middle zipper pocket can hold a 7.9" iPad Mini / 6" Kindle. EXTREMELY PRACTICAL - Comfortably holds a 13.3" Macbook Pro, tablet or a LAPTOP 14" and under. Pockets can hold your Smartphone/clothes/books/wallet/umbrella or water bottle and other essential items. DIMENSIONS - 11.81"L x 4.52"W x 16.33"H. Weight: 1.5 pounds. Adjustable back straps length: 35.82". Top Loop Handle drop: 2.6".